A delicate free standing lace wedding basket. 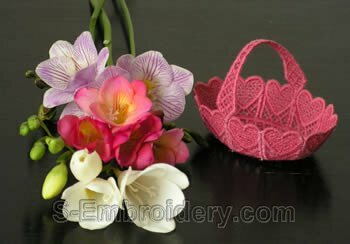 If you need something small to give as memory to the guests of a wedding, this design may be just what you are looking for. 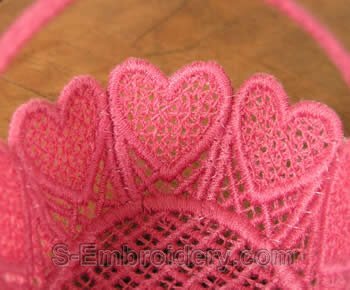 This an original freestanding lace embroidery which has been designed to be both beautiful and easy to stitch. The bottom and the side panels are done in one piece. 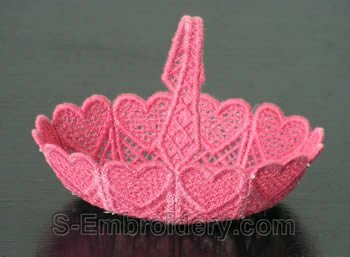 The handle is also included in the same embroidery file, so, in order to stitch out one basket you need to hoop only once. 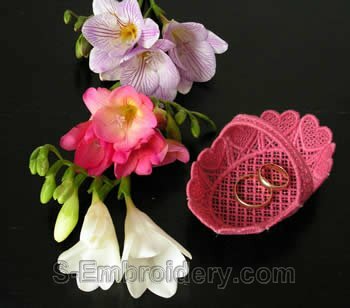 Buy the SKU 10230 Free standing lace wedding basket set and save 50%.